The sun rises south of east and sets south of west during November. 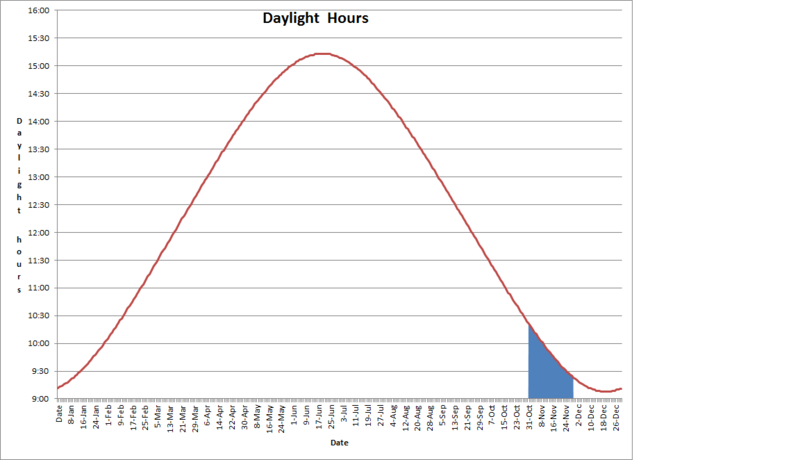 The chart about shows the length of daylight throughout the year — the red line. The blue area shows the length daylight during November. The mid-northern latitudes lose nearly an hour of daylight during the month. First Quarter 11/07/16 (1:51 p.m.) 12:42 p.m. 11:23 p.m.
Last Quarter 11/21/16 (2:33 a.m.) 11:05 p.m. (11/20) 12:46 p.m.
New Moon 11/29/16 (6:18 a.m.) 6:46 a.m. 4:57 p.m.
Times are Central Standard Time for Chicago, Illinois, from US Naval Observatory calculations. 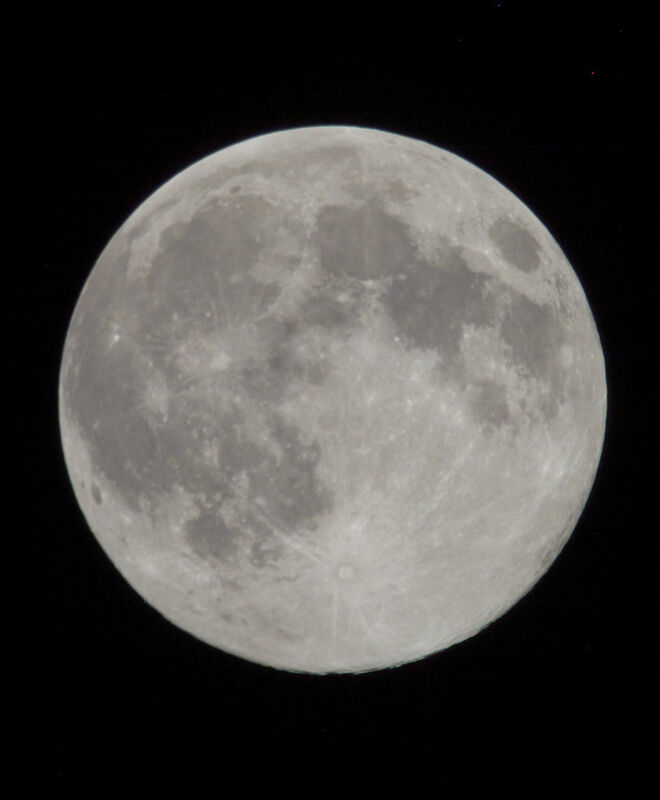 The Supermoon idea is not an astronomical concept and it appears to have originated in 1979. This is described to when the moon appears at its full phase when it is at its nearest point to earth (perigee). At this supermoon, the moon reaches perigee nearly 3 hours before it is opposite the sun at its full phase brilliance. The result is that it appears brighter (although nearly imperceptible) in the sky and about 14% larger than the typical full moon, again not noticeable for most of us. The moon appears larger when near the horizon and this does not cause a supermoon. The moon illusion is explained in several ways. Here’s a way to measure the size of the moon when near the horizon and then higher in the sky. Locate the moon and extend your arm. Notice that the tip of your little finger covers the moon. Try the same again when the moon is higher in the sky. Compare the two views. Jupiter is the bright “star” in the eastern sky as the sky brightens. On November 1, Jupiter rises 2 hours, 15 minutes before the sun. As the month progresses it rises earlier each morning. By month’s end Jupiter rises nearly 4 hours, 30 minutes before sunrise. 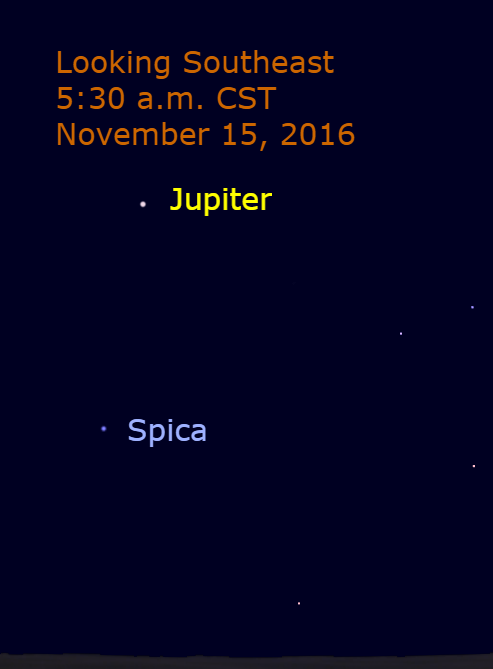 At mid-month, Spica appears about 10 degrees below Jupiter. Jupiter, Spica and the moon. 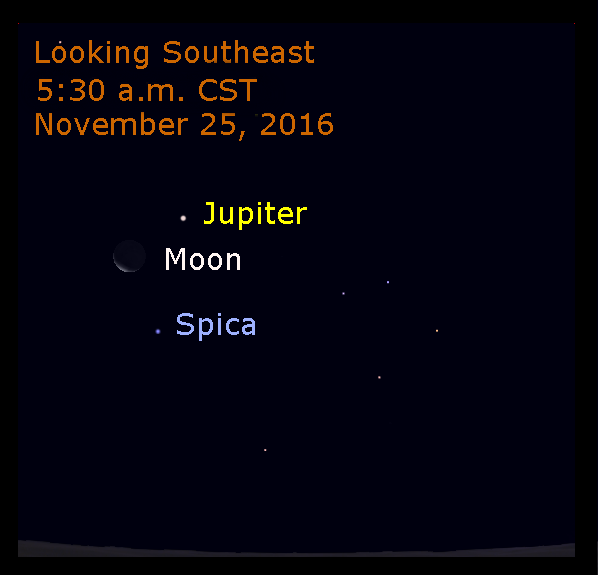 The moon is 5 degrees from Jupiter and Jupiter is 9 degrees from Spica. 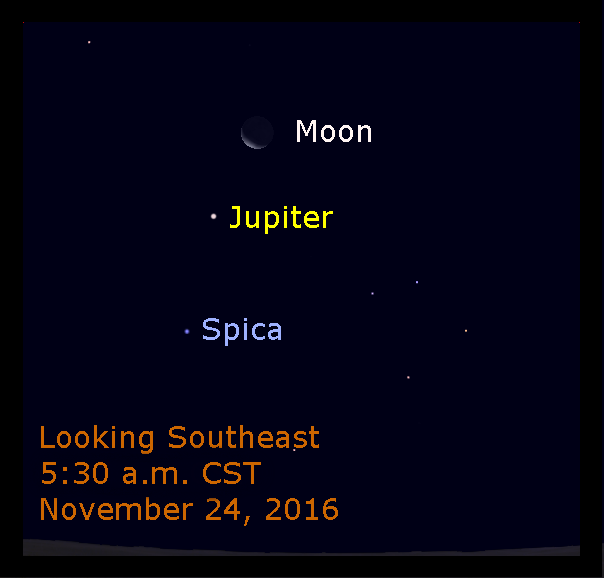 On the mornings of November 24 and 25, the moon appears near Jupiter and Spica. Venus dominates the western early evening sky. On November 1, it sets about 2 hours after the sun and 3 hours after the sun at month’s end. Mars and Saturn also appear with Venus in the western sky early in the month. 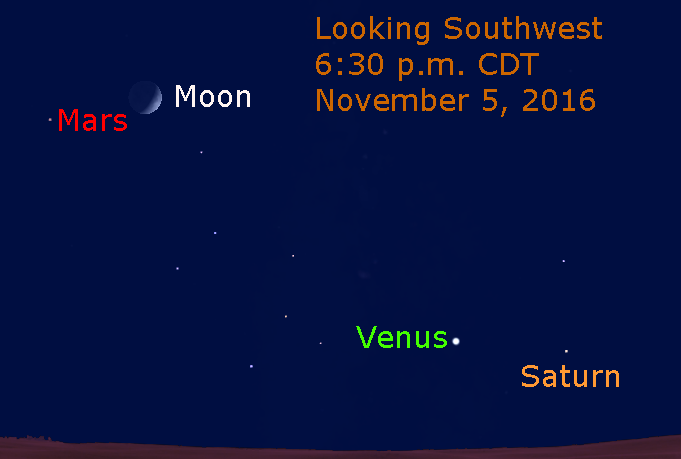 On the evening of November 2, the moon appears near Saturn and Venus. Venus is 6.5 degrees from the moon and 5 degrees from Saturn. Mars appears over 36 degrees to the upper left of Venus. A few nights later, the moon appears 7 degrees to the upper left of Mars. Venus is 35 degrees to the lower right of Mars and Saturn is 8 degrees Venus. 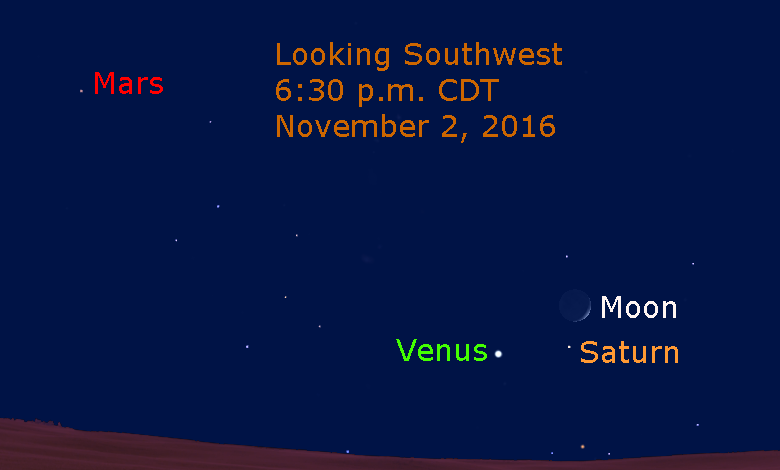 Venus and Mars move quickly eastward among the stars and Saturn disappears into the sun’s brilliant glare. 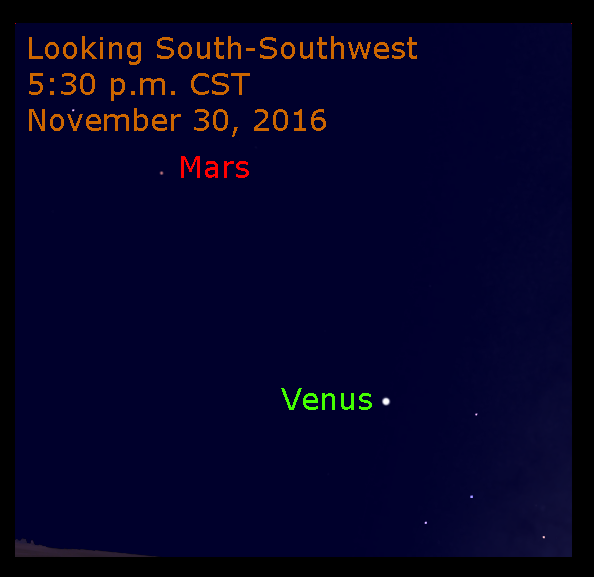 By month’s end, Venus and Mars are 25 degrees apart. Mercury passed superior conjunction on October 27 and is moving into the evening sky. More about it next month. For more details about Jupiter, Spica, Mars and Venus, see the articles linked at the top.